Allows you to put 4 Lug VW (4 on 130) on to Link Pin & Ball Joint Front Ends. 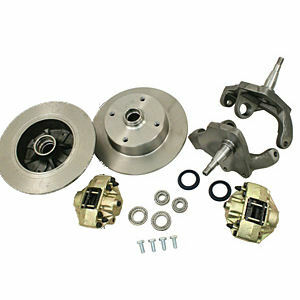 Also available to do are 5/130 (Porsche) and Chevy (5 on 4 3/4) Front Drop Spindle Disc Brake kits on the same. This kit will give you a dropped front end and a Disc Brake upgrade all in one package. These spindles drop the car 2 1/2" with a 1/4" outward offset. 5 lug Porsche patterns are modified with M14-1.5 threaded wheel studs hole and Chevy a 12mm (5 on 4 3/4) Includes: Rotors, Calipers, Pads, Wheel Bearings, Seals, Spindles and Hardware. Link Pin kits come with brake hoses, thrust washers & spindle nuts. Does not work with 14" wheels. Uses 1969 and Later Tie Rod Ends. Click Product Options to choose your kit.